Americas gateway to the universe. Leading the world in preparing and launching missions to Earth and beyond. 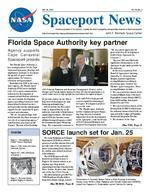 Jan. 24, 2003John F. Kennedy Space Center Spaceport Newshttp://www-pao.ksc.nasa.gov/kscpao/snews/snewstoc.htmVol. 42, No. 2(See SORCE, Page 8) Inside Page 7  Six-week fitness program begins in February. Page 3  KSC works with State University System. Page 2  Recognizing Our People honors employees. Pages 4-5  45th anniversary of Explorer 1.Florida Space Authority key partnerAgency supports Cape Canaveral Spaceport projects(See FSA, Page 7)SORCE launch set for Jan. 25The Florida Space Authority, a key strategic partner for the Cape Canaveral Spaceport, develops and implements strategies to accelerate the growth of space-related opportunities for business, education and government. Established in 1989 as the states space agency, the Florida Space Authority (FSA) serves multiple roles: It is a space transportation authority for development of commercial and dual use infrastructure, an economic development agency providing businesses with financial and technical services, and it provides facility and program support for the expansion of space research and education. We see our partnerships with NASA and the Air Force in terms of our role of a cooperating agency, said FSA Executive Director Ed Gormel. Because of the flexibility of our state charter we are able to help those federal agencies with financing and marketing. NASA and the Air Force have come to depend heavily on the authority, especially to help finance capital improvements. The finance arm of FSA has become a stateaffiliated nonprofit agency, called the Commercial Space Financing Corp. The corporation continues to work with FSA to help provide venture capital for financing of aerospace development projects across the state. The Florida Space Authority and the Commercial Space Financing Corp. have an extremely important role in the development of the Spaceport, said Jan Heuser of KSCs External Relations and Business Development Directorate. We very much appreciate the great work they do in helping us build a better Spaceport for everyone. The year 2002 was filled with significant advancements at the Spaceport in part made possible by the authority. At the recent quarterly FSA Board of Supervisors meeting, chaired by Lt. Governor Frank Brogan, reported significant accomplishments resulting in increasing space business for Floridas space enterprises. Those accomplishments include:The successful first launch of the Lockheed Martin Atlas V Evolved Expendable Launch Vehicle (EELV) from a $292 million launch pad financed by the FSA.The successful first launch of the Boeing Delta IV EELV vehicle from the authority-financed and built, on time and under budget, $24 million Horizontal Integration Facility.The issuance of the Cape The Solar Radiation and Climate Experiment (SORCE) is a NASAsponsored satellite mission that will provide state-of-the-art measurements of incoming X-ray, ultraviolet, visible, near-infared, and total solar radiation. The SORCE spacecraft will launch from Orbital Sciences Pegasus XL launch vehicle in an airplane type drop launch orginating from Cape Canaveral Air Force Station. At press time, launch was set for Jan. 25 at 3:14 p.m. The measurements provided by SORCE will specifically address long-term climate change, naturalKSC External Relations and Business Development Director JoAnn Morgan and Florida Space Agency Director Ed Gormel participate in a recent trade show to help spread the word about the space program. Technicians in Kennedy Space Centers Multi-Purpose Processing Facility move NASAs Solar Radiation and Climate Experiment (SORCE) toward the Pegasus XL Expendable Launch Vehicle for mating. SPACEPORT NEWS Jan. 24, 2003 Page 2 Recognizing Our PeopleKennedy wins distinguished medalFEW offers scholarshipsThe Space Coast Chapter of Federally Employed Women (FEW) is awarding scholarships for high school and/or college students who are currently attending college or enrolling in the fall semester 2003. Students must have a GPA of 3.0 or higher to be considered. Applications should be received by March 14. For additional information or to apply, please contact Jane Eitel/QA-D at 8677952, Maxine Johnson/YA at 867-7770 or Karin Biega/ XA-A at 867-6382.Scientist honored for international effortsKennedy Space Center Deputy Director James Kennedy recently was honored with a NASA Distinguished Service Medal. Kennedy was nominated for the honor by the Office of the Director of the Marshall Space Flight Center. He was honored for his distinguished service to the Agency through exemplary managerial performance and outstanding technical leadership for MSFC. Appointed deputy director of MSFC in January 2001, Kennedy continually demonstrated exemplary leadership skills in assisting the center director in managing a broad range of propulsion, space science and materials research and development in support of the Nations space program. Kennedy was a positive change agent within MSFC and led the Centers activities in support of the Agencys Strategic Resources Review, a Centerwide initiative to balance Marshalls workforce, and an effort to staff the Space Launch Initiative. With his leadership the Center effectively worked to reduce costs while maintaining critical work. Kennedys innate ability to lead people was demonstrated regularly with his vision focused and people oriented management style. His management style ofJames Kennedyinclusion and openness promoted an atmosphere of trust and communication and an environment conducive to building coalitions and opening lines of communication. He was instrumental in developing the National Center for Advanced Manufacturing, a partnership involving NASA, the State of Louisiana, academia and industry. As director of MSFCs Engineering Directorate from 1999 to 2001, Kennedy established and directed the Centers research and development capability for accomplishing crosscutting engineering functions associated with the design, development, testing and evaluation of assigned projects. He did an outstanding job of leading the directorate in support of Space Shuttle, Chandra X-ray Observatory, Space Transportation, Flight Projects, Advance Technology Development, International Space Station, and numerous Earth and Space Science payloads. As SRB project manager from 1996 to 1998, the flight hardware managed by Kennedy successfully flew on 12 Space Shuttle missions without any anomalies. Kennedy led two major organization changes at MSFC. He led the Science and Engineering reorganization as an integral part of an overall Center reorganization, completing the task in an unprecedented five months. The new Engineering Directorate is half the size of S&E and has gained the full support of the workforce, customers and Center management in becoming what is one of the best engineering organizations within NASA. He also led the transition of the SRB project from its previous role of Government oversight to its current role as insight, and the subsequent transition of the contract to United Space Alliance. Throughout his career at MSFC, Kennedy provided distinctive service and outstanding leadership. The Universidad Austral of Chile recently recognized Dynacs Ravi Margasahayam, principal Investigator of Kennedy Space Centers Launch System Testbed, for his outreach efforts. Dr. Jorge Arenas, associate professor, and Institute of Acoustics at the university sponsored the honor. Margasahayam was invited to Valdivia, Chile, December 2002 to lecture on behalf of KSC Public Speakers Bureau. He shared mementos from NASA with faculty and students. Dr. Margasahayams lectures were focused both on promoting NASAs mission and presenting a brief overview of research being conducted on vibroacoustics in the Launch System Testbed, which is a hot topic in the acoustical community, Arenas said. In association with the outreach efforts to Chile, Spaceport Engineering and Technology Director Jim Heald authorized a Chilean student to begin an internship at KSC in January 2004. Researchers at KSC have the opportunity to reach out to partner with researchers across the world, Margasahayam said. We just have to make the effort to do it.Dynacs Ravi Margasahayam (center), principal investigator of Kennedy Space Centers Launch System Testbed, receives an honorary plaque from Jorge Somerhoff (left), director of the Institute Acoustics Universidad Austral of Chile. At right, is Margasahayams sponsor Dr. Jorge Arenas. Page 4 SPACEPORT NEWS Jan. 24, 2003 By Kay Grinter America was thrust into the Space Age 45 years ago on Jan. 31, 1958, with the launch of Explorer I, Americas first scientific satellite. In retrospect, the Space Age was born a few months earlier, on Oct. 4, 1957, with the launch by the Soviet Union of Sputnik I, the first artificial satellite to orbit the Earth. This 23-inch-diameter, 184-pound ball captured the imaginations of people all over the world because it could be seen and heard as it passed overhead. NASA retiree John Twigg remembers watching Sputnik streak through the sky over Cape Canaveral and being awed by the knowledge that it was man-made. He was a control systems engineer with the Army Ballistic Missile Agency (ABMA), the group that built the modified Jupiter C rocket used to launch Explorer I. In 1957, he recalls, the term space program was not in common usage. It was before NASA was created, before President Kennedy had issued his challenge to send a man to the moon, and before we thought of ourselves as involved with the Russians in a space race. NASA retiree Terry Greenfield, currently working at KSC as a senior engineer for Dynacs, recalls that UDMH  unsymmetrical dimethyl hydrazine  a toxic, corrosive propellant  was being45 years ago: Ex p Explorer I blockhouse activities: Seated at the consoles from left were Curlie Chandler, Carl Whit e Ike Rigell, C. D. Sweat and Terry Greenfield.Standing facing consoles were Milt Chambers and B o Moser. Looking over the consoles with their backs to the windows were Capt. Wesley Nichols, Bo b Gorman and Albert Zeiler. Explorer I launch team managers check out the launch pad prior to launch. From left were Bob Gorman, Andy Pickett, Albert Zeiler, Dr. Hans Gruene and Dr. Kurt Debus. Explorer I, Americas first satellite, launched on Jan. 31, 1958. Page 5 SPACEPORT NEWS Jan. 24, 2003 Remembering Our Heritageused in the Jupiter C. We were told that it had a fishy smell and could be very hazardous to our health. The launch team at Complex 26 was required to submit to physical exams to be used as baselines in the event of a leak. When the time finally arrived to attempt the launch, two scrubs were caused by high velocity, upper level winds. On the night of Jan. 31, weather forecasters were not optimistic that the winds would subside, but the countdown picked up at Complex 26 all the same. In the blockhouse, smoking was permitted. NASA retiree Robert Moser, the test conductor with the ABMA, was there and recalls, It was hot, smoky, and noisy. The commands in the countdown sequence were sent manually so everyone on the team was busy. Meanwhile, in Huntsville, former Deputy Director of Design Engineering at KSC Chet Wasileski was assigned to Launching and Handling with the ABMA. He recalls, Our group provided ground support equipment for Army programs at the Cape. Since we couldnt be there, we passed the time playing poker until we heard there was a successful launch. The winds cooperated, and launch occurred at 10:48 p.m. EST near the opening of the 10:30 p.m. to 2:30 a.m. EST window. The tiny 31-pound Explorer satellite did its job well. A pencillike tube, it was 80 inches long and six inches in diameter  too small to easily be seen from the ground. However, the 18.13-pound scientific instruments aboard identified a radiation belt around the Earth predicted by Dr. James Van Allen of the University of Iowa  a fact that elementary school students are taught today. The months preceding January 31, 1958, were crowded with launches, but the names of the vehicles  Redstone, Thor, Jupiter, Polaris  were all associated with missile programs. Then President Dwight D. Eisenhower was determined that the fledgling American space program not be perceived by other nations as a military initiative. In a message to Congress on April 2, he proposed the establishment of a National Aeronautics and Space Agency into which the National Advisory Committee for Aeronautics (NACA) would be absorbed. This new agency would be responsible for the countrys civilian space science and aeronautical research and could conduct research in these fields in either its own facilities or by contract. The National Aeronautics and Space Administration began operation in October 1958. Explorer I transmitted data back to Earth until May 23, 1958, when its batteries failed. However, the tough little spacecraft remained in orbit for over 12 years  until March 31, 1970. p lorer I e side, o b b Above, Explorer I is checked before launch. At right, Explorer Is Jupiter C rocket on the pad. SPACEPORT NEWS Jan. 24, 2003 Page 7FSA ...(Continued from Page 1)Canaveral Comprehensive Spaceport Master Plan, a groundbreaking plan developed by the Authority, NASAs Kennedy Space Center and the U.S. Air Forces 45thSpace Wing. This vision for the next 50 years will take the Spaceport from being primarily a launch site into a world center for space commerce and research.Construction continues on time and under budget, with an August 2003 completion date, of the Space Experiment Research and Processing Laboratory (SERPL), the authoritys partnership with NASAs Kennedy Space Center to build a 100,000-plus-square-foot research facility that will serve as the primary gateway for scientific research to the International Space Station. Approximately 20 percent of the SERPL facility will be available for use by Floridas university researchers.Development continues on the International Space Research Park (ISRP), a key partnership between NASA and the State, to build a commercial business park on approximately 400 acres at KSC.The authoritys new marketing initiatives, including a world-class trade exhibit, are taking Floridas small and large space businesses to premier national and international forums, including the World Space Congress. This has been a positive year for Florida space business and the opportunities for future growth are exciting, FSAs Gormel said. With both the EELVs and the International Space Station now operational, and new vehicles and technologies moving forward, the hard work of the partnership is starting to pay off. Frank Dibello, head of the Commercial Space Financing Corp., agrees with Gormels positive view. FSA and the corporation over the years have helped provide about $500,000 million in financing for aerospace development projects at the Spaceport and across the state. Currently about 30 projects need funding, so you can see theres much demand for the service we offer, Dibello said. We are an essential resource for fostering space business in Florida. Prior to 2002, FSA and the corporation helped finance the construction or expansion of several other launch pads at the Cape Canaveral Air Force Station, the reusable launch vehicle hangar at Kennedy Space Center, the Apollo/Saturn V Center, payload assembly and processing facilities, and U.S. Space Camp and the Astronaut Hall of Fame. Also announced at the authority board meeting was the decision that Space Exploration Technologies Corporation (SpaceX) plans to use the Spaceport as the launch site for the companys new Falcon commercial rocket. Slated to begin flying in 2004, the Falcon is being designed by SpaceX to launch satellites and research payloads weighing up to 1,000 pounds for less than onethird of the cost of existing launch vehicles. The KSC Black Employee Strategy Team (BEST) will host the KSC 2003 African-American History Month celebrations in February. BEST would like to emphasize that all KSC employees are invited to participate as we honor the culture and contributions AfricanAmericans have made to the space program, our nation and the world.Feb. 5, Soul Food Fest Potluck  KARS II, food served 11:30 a.m. to 1 p.m. Tickets $5.Feb. 7, 14, 21, 28 BEST Fridays  Wear BEST or KSC Logo shirts for rotating visits to KSC Cafeterias: Feb. 7-HQ, Feb. 14-O&C, Feb. 21SSPF, Feb. 28MFFFeb. 15, BEST Black Tie Gala  cocktails/keynote speaker/live band/door prizes at the Radisson Resort at the Port, 6 p.m. $30.Feb. 20, Roots Family History Workshop  Learn how to find your ancestors and store the data. Training Auditorium, 1 to 2 p.m.Feb. 23, Church Fellowship/ St. James A.M.E Church/11a.m Service. For more information or tickets, contact Michelle Amos at 867-6681 or Michelle.E.Amos@nasa.gov .African-American History Month events hosted by BESTPresidential Management Interns The class of 2001 Presidential Management Interns (PMIs) hosted a conference at Kennedy Space Center Jan. 16-17 for all Southern Region 2001 PMIs. In attendance were PMIs from the Centers for Disease Control, Housing and Urban Development, and the Department of Transportation. Conference participants were invited to attend the Administrators Briefing and meet NASA Administrator Sean OKeefe (pictured above at center). OKeefe started his federal career as a PMI and often refers back to his time in the program. Along with attending the Administrators Briefing and launch, conference participants heard from a variety of former PMIs serving in various positions at KSC. Presenters were Rick Arbuthnot, director of Workforce and Diversity Management, Susan Kroskey, acting director of Cape Canaveral Spaceport Management Office, and Janice Robertson, chief of the Central Budget Office. The conference was organized by the 2001 Presidential Management Interns Matthew Lacey, VA, Dr. Doresa Perry, BA, and Randy Wasserman, GG. The PMI program was established by Executive Order in 1977 to attract to the Federal service outstanding individuals from a wide variety of academic disciplines who have an interest in, and commitment to, a career in the analysis and management of public policies and programs. By drawing graduate students from diverse social and cultural backgrounds, the PMI Program provides a continuing source of trained men and women to meet the future challenges of public service. Presidential Management Interns have completed a masters degree or Ph.D. and have commited to a career in federal service.